Congratulations to the Marquette Law Mock Trial Team who competed at the ABA Section of Labor and Employment Trial Advocacy Competition on November 3, 2018. 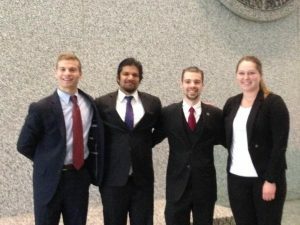 The team advanced to the Semi-final round of the competition, placing within the top four teams. Team members include Cole Altman, Katie Dvorak, Dan McCrackin, and Rohit Rangarajan. The team was coached by Katie Halopka-Ivery and Emil Ovbiagele. Congratulations, Team! We are proud of your hard work and success. Congrats! What a great accomplishment.